Hartington Colliery SK 47/57 434755. Extracts from the Staveley Coal and Iron Company Annual report of June 30th. 1875. 'The Ireland sinking into the Deep Soft or Hollingwood Bed at Staveley has been proceeded with, but considerable difficulties were met with the early progress of the works which materially delayed the sinking. The tubbing has been carried down from the surface to a depth of about 141 yards, and the whole of the water tubbed back, and no further difficulties are anticipated'. The new colliery (Ireland) on the outskirts of Staveley was to be connected underground to the nearby colliery at Hartington or New Hollingwood to pump and ventilate the workings. With this project in mind the company report of June 30th. 1877 reported that arrangements were being made to sink another shaft at New Hollingwood for the purpose of improving the ventilation and pumping facilities at the two collieries. The upcast shaft at New Hollingwood having previously only provided ventilation by means of an outdated furnace. The cost of these improvements being met out of the companies reserve fund. 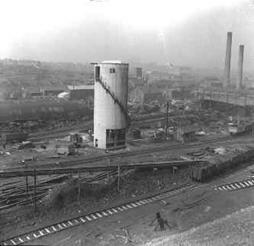 New Hollingwood colliery was originally sunk as a single shaft with a furnace for ventilation and was coupled underground to the older Staveley area collieries. (Date of sinking unknown). The next annual report for 30th. June 1878 reports that the sinking of the new, New Hollingwood shaft had been completed and the heavy pumping and ventilation machinery were to be it place and working by the end of the financial year. The ventilation system was completed on time but the pumping plant continued to be installed until the end of the year, on completion this led to the abandonment of four smaller pumping installations. Work continued at the New Hollingwood colliery with a staple shaft, (A shaft sunk underground between seams) being sunk in the vicinity of the pit bottom to prove the Blackshale seam. On completion of the staple shaft in 1879 the old shaft was extended into the Blackshale seam along with the new shaft at a depth of 390' from the surface followed by a link underground between shafts. to further extend the capabilities of the colliery. 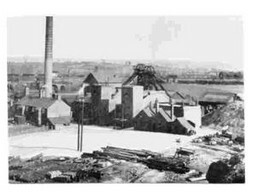 During 1880 the New Hollingwood colliery was near to completion and the surface plant was being installed to satisfy the market for the companies gas and house coal. 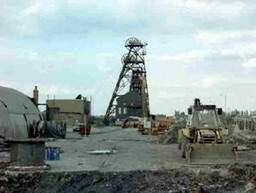 A delay had occurred in the work because four men were killed in an underground accident at the colliery. Taken May 1990 after reopening the downcast shaft. (This was incidentally the original upcast shaft as it includes the furnace drift). Temporary headstocks with winding kibble bucket and stage platform winding engine to right hand side. 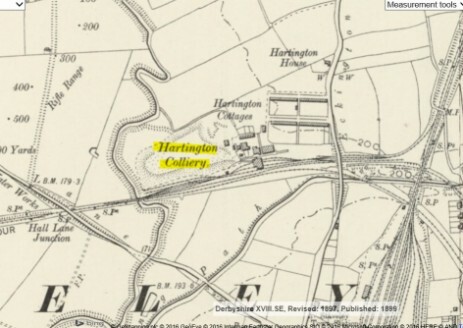 It was decided that in 1880 the new colliery was to be called the Hartington colliery from then on, a colliery village was built nearby to house the workforce and officials. 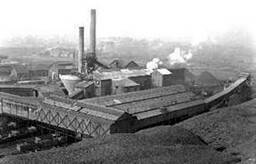 The colliery was finally completed prior to the annual report of 1881.As a part of the Ireland complex the collieries were able to produce more coal for the company than had been possible since its formation, the colliery ceased production in 1930 but was use as an egress for Ireland colliery. A few years ago I was fortunate enough to make several visits to Hartington colliery prior to the demise of the local coal industry. Hartington colliery or Hartington Silkstone was then used only as a second means of egress for Ireland colliery and after the closure of Ireland it was used solely for water pumping from the underground seams to protect Markham and Bolsover collieries from flooding. 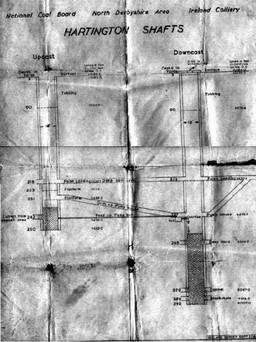 The pumps were situated in the pit bottom and were quite antiquated and so the firm of Cementation were lining the collieries old upcast shaft at the bottom to facilitate a large submersible pump to pump water into the nearby river Rother. Access to the mine for British Coal staff was via the old downcast shaft which was converted to an upcast shaft by the inclusion of a surface fan house and equipment which was now obsolete and redundant but all still in place. The winder which was part of our examinations was really only a large haulage engine and not what I would call a proper winding engine, the winding rope was only as thick as one of my fingers! The ride on the chair was quite sedate and on arriving in the wet pit bottom and stepping off the chair one noticed how low the roof was and how it was like stepping back in time to the so called golden age of mining. The compact pit bottom was not suffering from weight stress or floor lift on it, it was built that way. For many years the only way to ride the shaft was in a kibble, a large bucket, this was rather neatly placed at the side of the roadway next to the shaft. The colliery itself had not been used to mine coal for about forty or fifty years but was the centre of attention by the survey staff and the colliery officials from Markham who were checking plans and exploring behind stoppings and up old roadways, one poor soul had to walk from Markham through Ireland to Hartington and possibly back again through the old roadways on safety examinations. I cannot say definitively whether the walk was both ways or whether it was on a daily or weekly basis but it was done. One such stopping was removed to expose the staple shaft opened up to prove the Blackshale seam in 1879, before the main shaft was deepened to gain access to the Blackshale seam. This is reported in the Staveley companies Annual Reports in the 1870's. The cage is very small, possibly large enough for four men, it is very unstable and the sides of the angles could be moved from side to side easily. It was very rickety. 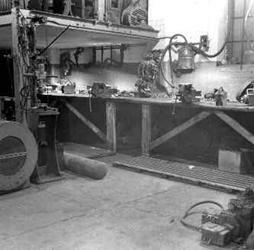 The steel winding rope was coiled up at the side of the chair, this was the thickness of my little finger and the winding engine was just a small haulage engine. 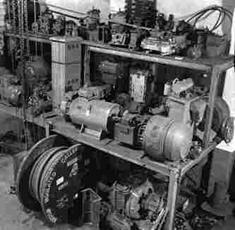 The old pump switch gear for the mine was housed in a room just off the side of the old upcast shaft in which the Cementation engineers were working. The idea was that when the new pump was installed the pit would flood and the rising water would be allowed to spill over into the shaft through a large letter box set into one side of the shaft for the submersible pump to keep the level from rising up the shaft. On one visit I was fortunate enough to ride in the contractors kibble out of the mine, this held four men comfortably. The shaft had a temporary winder above it with two sets of winding ropes. One raised and lowered the kibble in the centre for men and materials whilst the other ropes wound a platform up and down for the men to work on the sides of the shaft. This machine had seen service at various mines since the 1930’s. When the winder operated safety gates were lifted from over the shaft and one could see daylight from above, the walls of the shaft were damp and reflected the light to make it look like a spiders web shining with dew. On the way to the surface we passed the old furnace drift which in the days before proper fans were used housed a furnace. The furnace burnt coal, the hot air rose pulling with it air from within the mine and up to the surface thus ventilating the mine. Not very efficiently and very dangerous. The drift was like a large cavern running uphill and into the distance. In 1896. 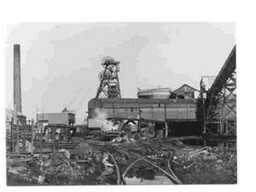 Hartington No1 Colliery employed 293 men underground and 39 on the surface. 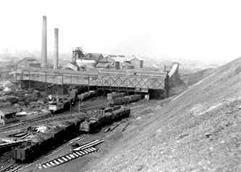 Hartington No2 Colliery employed 306 men underground and 44 on the surface. 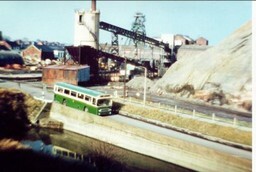 Ireland Colliery employed 620 men underground and 160 on the surface. Derbyshire Times 24th December 1921. A startling statement was made this week by Mr. D.N. 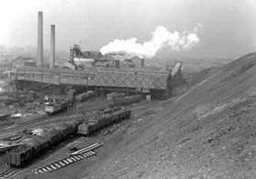 Turner agent to the Staveley Coal & Iron Company to the effect that unless the men at the Hartington and Barlborough collieries were prepared to accept a substantial reduction in wages the company could not see their way to run these pits any longer. Some 1,500 men will be affected if this drastic threat is carried out. With the winter approaching the untold suffering will be caused in the Staveley district unless the men are given employment at other pits under the company. 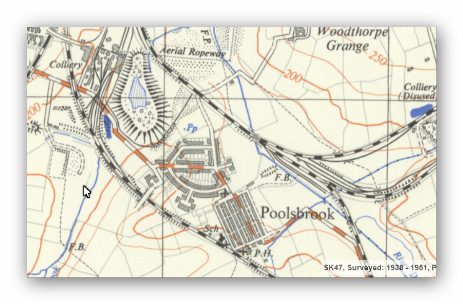 (1) Hartington or New Hollingwood Colliery. (3) Part of the old aerial ropeway which had recently been superseded by belt conveyers. (4) Ireland shortly after closure when we were searching for the Speedwell Shafts. (5) Simon Carves dirt bunker under construction. (6) General view taken from up on the tip. (7) General view taken from up on the tip. (8) The electric shop interior. (9) General view taken from up on the tip. (10) The electric shop interior. The end of the day for Ireland Colliery. Photographs copyright Peter Maxfield. 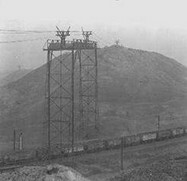 The photo's prove to be quite unusual because as the new headgear falls to the ground , the old , original headframe (to which the former steam winder was connected) is revealed beneath it . Many thanks to Peter Maxfield.